Engrossing story, unique game play mechanics and high replayability value. 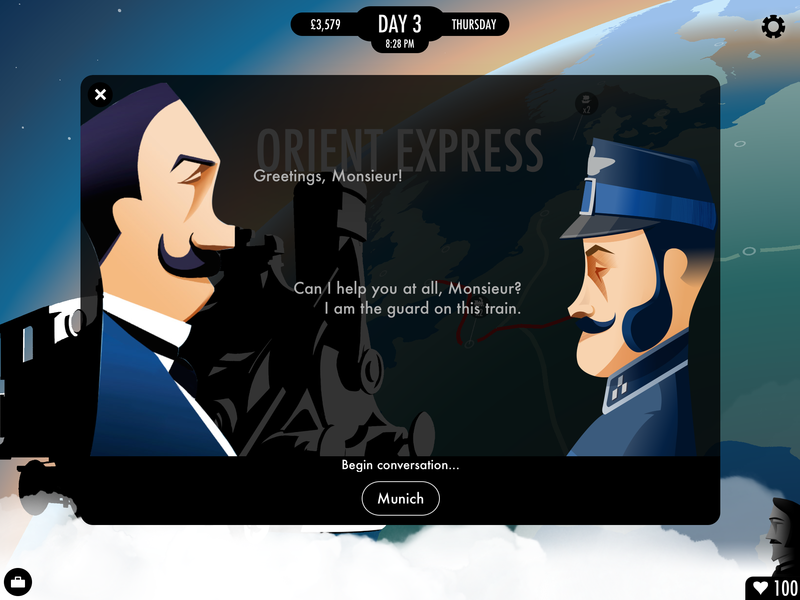 80 Days is a narrative adventure game set in 1872 where you have to successfully travel across the globe in 80 days or less. It’s developed by Inkle, the makers of the Sorcery! series, and is based on the adventure book, “Around the World in Eighty Days,” by Jules Verne. You play the role of Passepartout, a French servant to one Phileas Fogg, who has a bad habit of gambling, and one day after returning from the Reform Club, he informs Passepartout of their new journey. He tells Passepartout that they will be travelling around the world as part of a bet, and in order to win this bet they will have to do so in less than 80 days with their starting point being their current city, which is London. They can use whichever means of travel possible and take any route they want. And in this steampunk world there are many means of travel available from high-speed trains to various airships created by Artificers, and even Gyrocopters. But it won’t be an easy journey despite all of this technology because funds are limited, and with Fogg’s compulsive bet, you don’t know any routes to take so you have to learn them from conductors, locals, markets or anywhere else while traveling. And Mr. Fogg doesn’t seem to be cut out for some of the rough travel ahead so you’ll also have to monitor his health during this time as well as your own. A one of a kind adventure lies ahead and if you succeed so does glory, fame and fortune. Can you race against time and avoid all the hazards in the world ranging from weather to war or will you ultimately end up in a foreign country broke trying to become accustomed to your new life as a beggar on the street? I really enjoyed Inkle’s Sorcery! 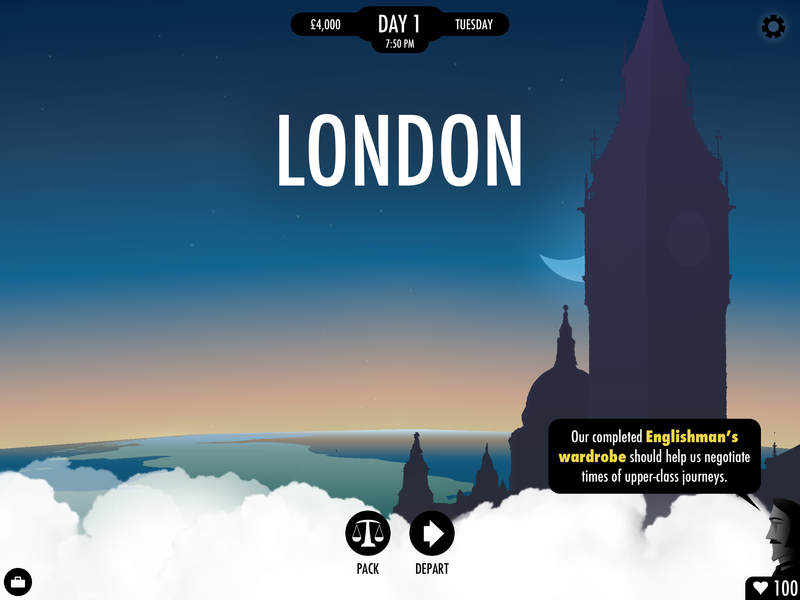 games so when I heard about 80 Days I knew I wanted to get my hands on it and see how the genre has grown. If you’re unfamiliar with Inkle or Sorcery!, it’s an interactive storytelling game that gives you control over how your journey plays out, and not just due to macro decisions but micro decisions every step of the way. So if Sorcery! 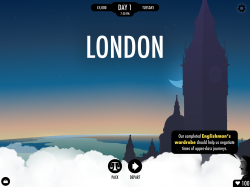 was the progenitor of a new and exciting genre that combined game play and story telling in an unprecedented way then 80 Days is the evolution of that genre and takes it to a new level. And if you played the Sorcery! games then you’ll see how the layout is just amazing in comparison, and the graphics have a very endearing quality to them as well. You’re immediately thrown into this trip around the world after a brief interaction with Mr. Fogg and it works very well in terms of creating the hectic environment one would imagine the start of a trip around the world would be at the spur of the moment. You have to pack your suitcases and you’re given a brief description of the items you can select by holding your finger on them. This is crucial to the trip because different items have different benefits, and some can truly enhance your travel over a number of days while others provide a one-time benefit. Taking a train schedule for Asia will reveal all the different routes in Asia, while specific clothing will allow you to negotiate time tables or get traveling discounts. Prominent at the top of every screen is the number of days you’ve been travelling, the amount of money you have left on you, and the time and day of the week. Touching the time of day will advance the clock by one hour. Each city you visit has up to 4 activities you can partake in: Market, Bank, Explore and Plan/Depart. Each activity takes a specific amount of hours so you have to choose wisely, and the game does a decent job of easing you into it. The Market is where you can buy or sell items in that city, Bank allows you to withdraw more money (and higher amounts can take up to a week), Explore opens up options for you to interact with the locals, and Plan/Depart takes you to the 3D world map so you can view all the known routes and necessary information such as mode of transportation, cost, time-table, etc. The bottom left corner has a suitcase icon that allows you to see what you’re carrying at all times, and some modes of transportation will require you to buy more storage space if you have too many suitcases. And the bottom right corner is actually Mr. Fogg, and represents his health as well as your relationship with him based on your care. I felt very engrossed early on and not just due to the enhanced graphics and presentation but the sounds, which did a great job in pulling me into the immersive environment being created. And I definitely felt the urgency in my start as the time moved constantly when on the world map travelling or planning ahead. Once I got the hang of it things became easier because the understanding of how time actually worked in this game became clearer and that’ was key. And the world you travel through isn’t one that will be completely familiar because the locations are real but the technology has steampunk origins, and this is perfectly woven into the story when you interact with people to become familiar with the world, and you’ll appreciate the differences in each location. You’ll always have more than one option to choose from when interacting with people or deciding what to do while in a city so you’re shaping your journey in more ways than just choosing a route. You’re defining your character too, and you’ll see updates after interactions that reflect changes in your character that will factor in towards the ending. Who would’ve known that traveling on an airship in 1872 above Europe could be so entertaining, or riding on a train in Russia that travels over water leaving you questioning others as to how it works could be fascinating. 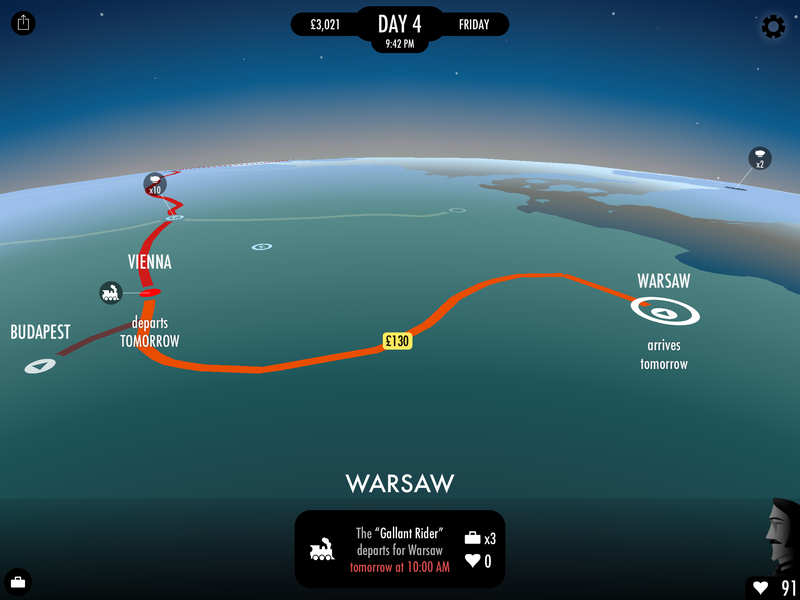 It’s a lot of fun to zoom out on the map and look at the different locations and wonder where you’ll receive information for new routes to connect cities you would like to travel through, and sometimes that comes when you’re on a train or an airship. You’re given an opportunity to converse with others and you can question them about cities, and if there’s a route from one to another. Unless you have cities in the area memorized from the map (or you’re an expert) you might end up just guessing when questioning others since it’s done on a separate screen and not the world map. And if you ask about the wrong cities too many times the conversation ends unless you have an item that’ll allow you to ask additional questions. As the game goes on you’ll become familiar with this but it’s important to plan ahead and spend time looking at possible destinations. And it is a good feeling when you see new routes are discovered and drawn on the map. Ernest Hemingway said, “It is good to have an end to journey toward; but it is the journey that matters, in the end,” and 80 Days seems to share that sentiment. You can come across an official who wants you to travel to a specific city to help out one of his spies, and if you choose to go there you can either help her out or turn her in based on your beliefs. Or you can come across a boxer in another city and have to fight him as part of a wager and have to successfully throw different punches or block based on his moves. One thing is clear: The Passepartout that leaves London won’t be the same one that returns. This doesn’t mean that 80 days isn’t without its faults. You are Mr. Fogg’s servant and he’s a burden way more than he is helpful as you’ll have to choose between what will be beneficial on the journey to advance or just cater to him for a night so his health doesn’t get too low. I understand the game play mechanic is to put you in Passepartout’s shoes even more, and when the trip is going smoothly it’s not an issue at all because it seems minor. However during one playthrough I was running low on money and travelling through cities without a bank, and the routes were rough and expensive. Mr. Fogg’s health only got lower and catering to him prevented me from exploring for new routes or earning a few extra pounds to travel. So I ended up stuck in a city in Africa and I couldn’t travel back nor did I have any routes to move forward, and had to nurse him back to health. I ended up permanently stuck in that city and made a living begging (and learned the max) and staying in a hotel. And there was nothing that Mr. Fogg could add to the situation. So it’s possible to fail in more ways than to exceed the 80 days but with the right choices and understanding that the journey is just as rewarding as the wager, if not more so, 80 Days is a gaming experience unlike any other. 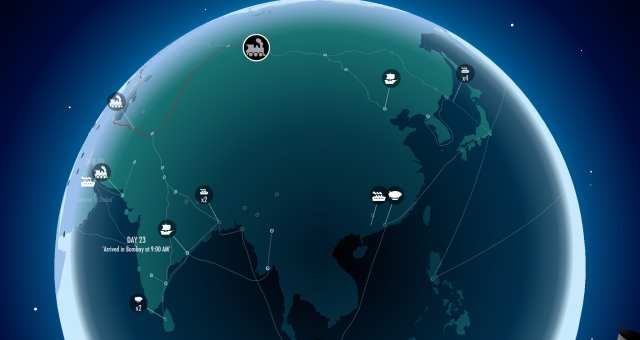 80 Days is an extremely enjoyable journey that is rewarding in terms of both its gameplay and immersive world, and you’ll be left wanting to see how things would’ve turned out if you selected a different route. On a technical standpoint, 80 Days could be the watershed moment for narrative adventure games as it seamlessly blends its interactive mechanics with visually and aurally stimulating features making for the most engrossing game from Inkle to date. It has a couple of issues related to Mr. Fogg, the cost of certain routes, and questioning other characters to acquire new information. 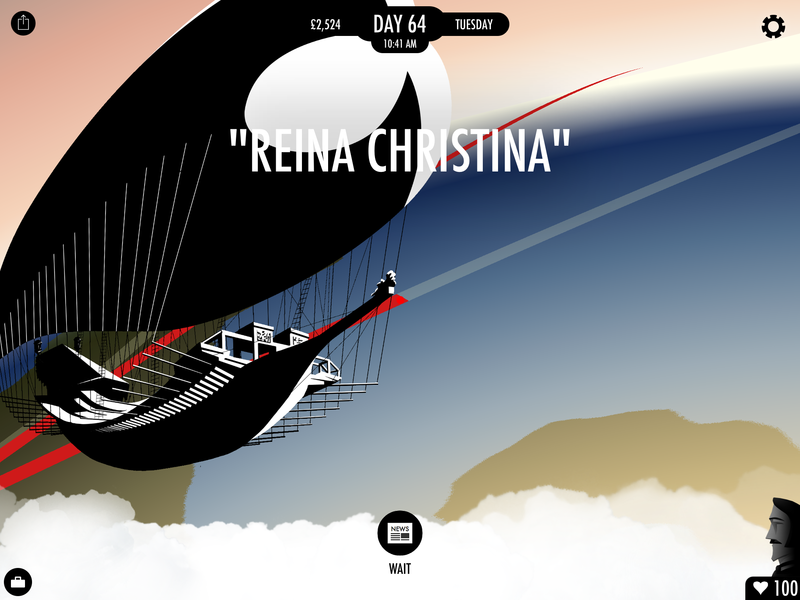 However, I highly recommend 80 Days for its unique gaming experience and engrossing story line.